terminology – Interested in Learning How to Find, Select and Eventually Live On Board Your Own Sailboat? You're in the Right Place…. 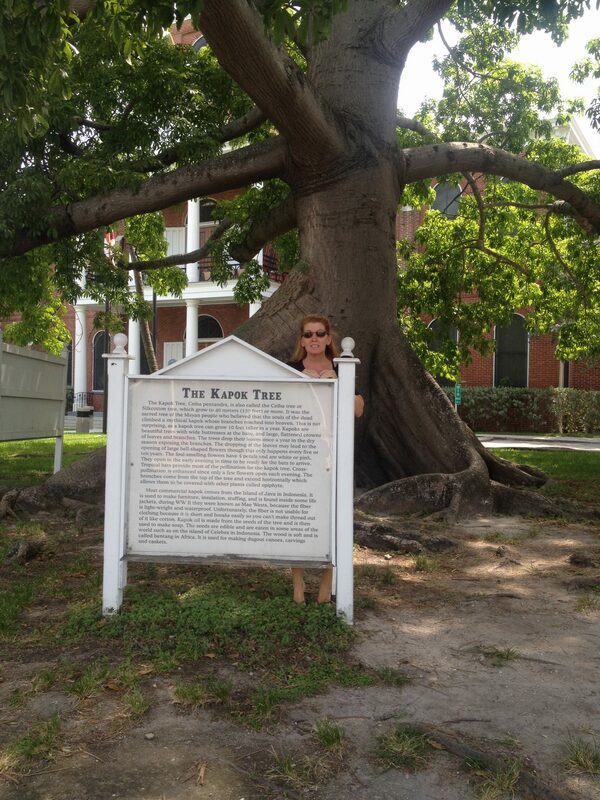 When we arrived in Key West, after our overnight stay at Looe Key Reef,… (See that post here …. https://learntoliveaboard.com/2016/07/scenes-from-along-the-way-to-dry-tortugas-via-key-west/ ) we spent about 90 minutes navigating the entrance to Key West from the South. There was no shortage of small and large traffic including a departing cruise ship. We had called ahead and arranged for a mooring ball in the Garrison Bight Mooring Field. 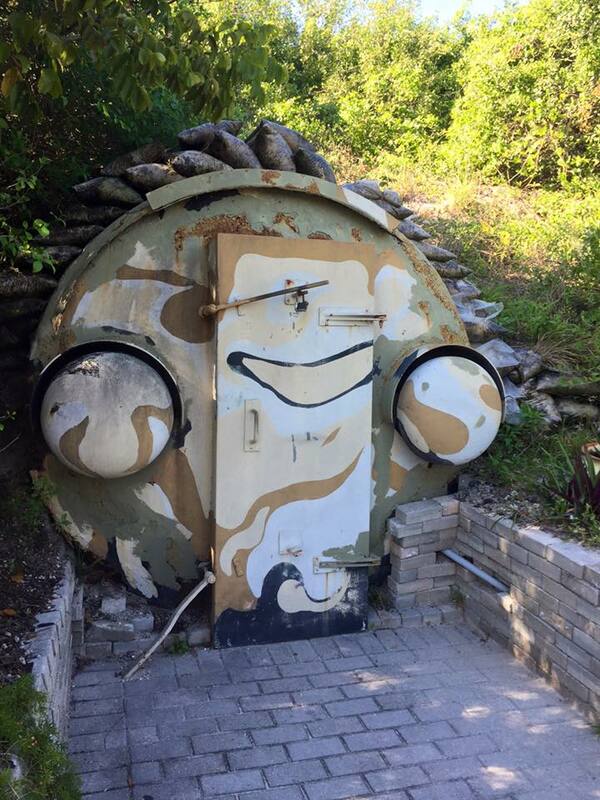 We made our way around Fleming Key, which is the home of the U.S. Army Special Forces Undwerwater Training Center which is located at it’s north tip. The island also has a waste water treatment system and a Dolphin Training Center !! You do see a conspicuous number of dolphins cruising between the boats anchored on the west side of the island. There are A LOT of boats anchored on either side of the channel in the area between Key West proper and the channel on the west side. 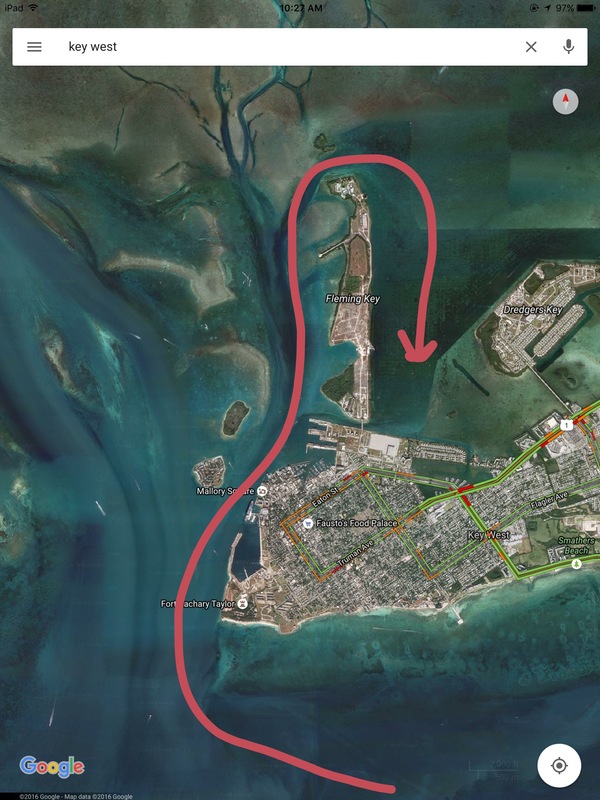 There are a great many people who find it cheaper to buy a boat and live at anchor than to rent an apartment or commute from the upper keys when working in Key West. This was the first time we tried our tactic of picking up a mooring ball from the stern swim platform (Kim’s idea). I have to say, it worked really well and avoided all the extra stress and strain of leaning over the bow to snag the pennant. The bow of Kitty Hawk is about 5′ above the water line. Our initial concern was that the weight of the boat would make getting the pennant from the stern to the bow impractical. We used our “Grab-n-Go” (a special spring loaded, gated, stainless steel hook that attaches to an extendable boat hook) to grab the pennant and lead it forward to our lines. 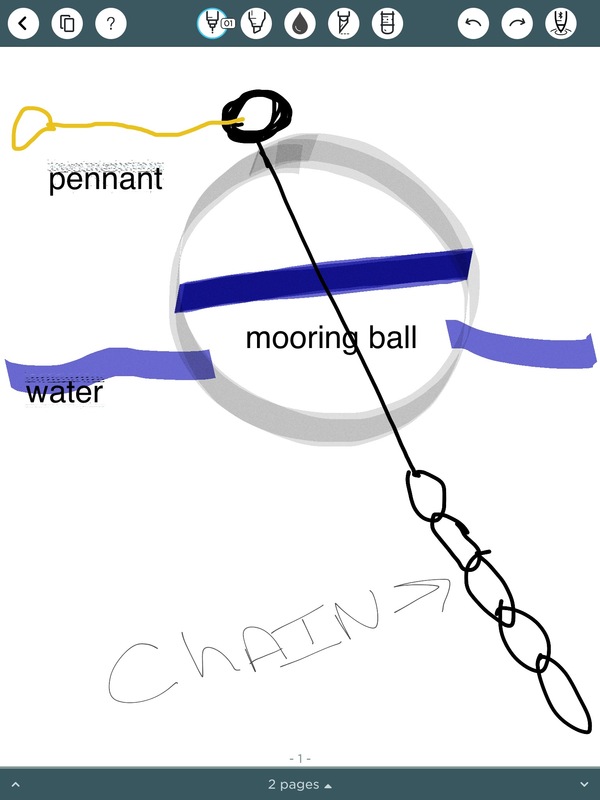 Here’s a diagram for anyone unfamiliar with a mooring ball…. The 2′ to 3′ white, floating ball, usually has a blue line running horizontally around it, is attached to the bottom by a piece of heavy chain. A steel rod or chain runs through the ball to the chain that leads to the bottom. At the top, is a steel loop or large eyebolt that attaches to the pennant. On the bottom of the body of water there might be a large concrete anchor or really anything heavy, sometimes there is a helix style pin screwed directly into the sea or lake bottom. The pennant is the (normally) yellow tether, usually a heavy nylon rope with a loop covered by chafe guard on the free end. 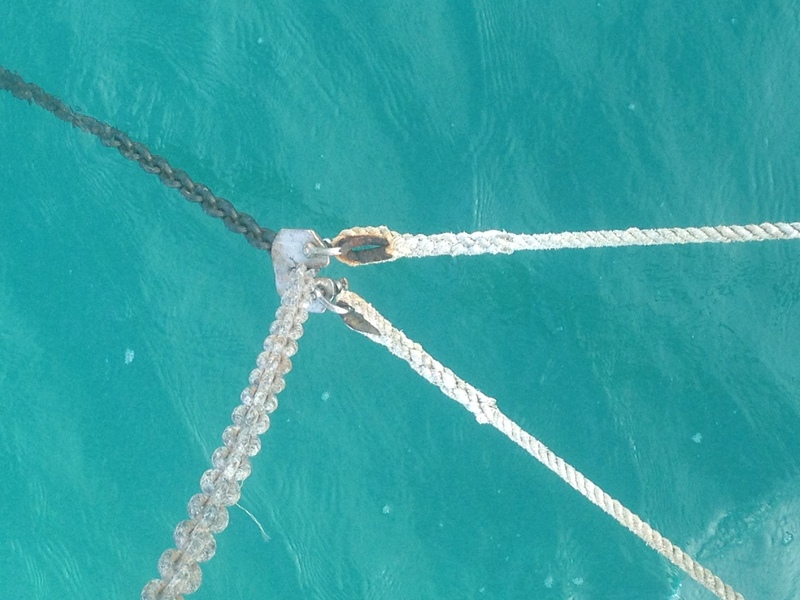 The mooring ball was about $300 for a month, as opposed to $1700 a month for a dock in Key West. If you plan to stay on a ball more than 17 days it is actually more affordable to just pay for a month on the ball. The downside is that the mooring field is a 15-20 minute (sometimes pretty wet) dinghy ride in to the city dock and about a mile walk to downtown. We didn’t find that too bad most days since we counted the walking as our exercise for the day. We spent just over three weeks in Key West not counting our small break for our trip to Dry Tortugas. 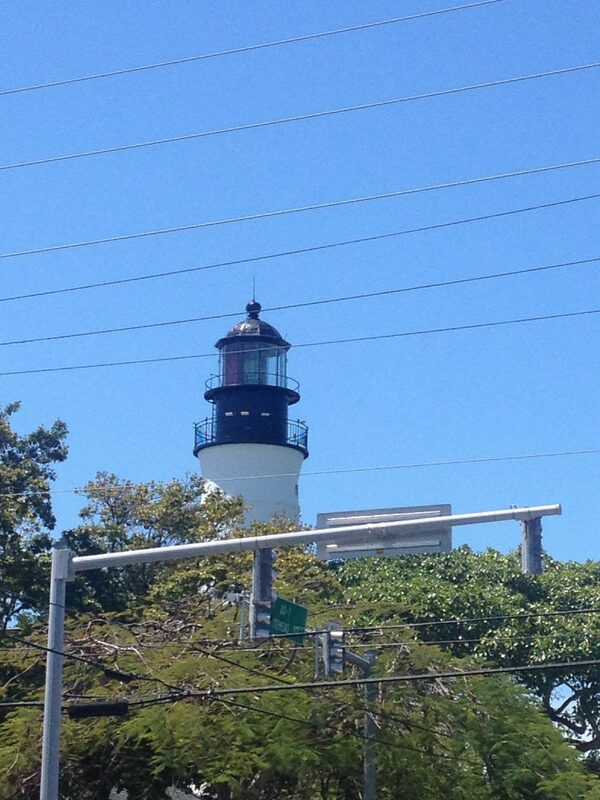 Here’s some shots from Key West…..I took these with my iPhone 4S….I either need a new phone or a dedicated camera….. I would have liked to enlarge these remaining photos but the software for the blog seems to be wiping out the rest of the post every time I try to do so. Sorry…I’m afraid you’ll have to click on them to see greater detail….. 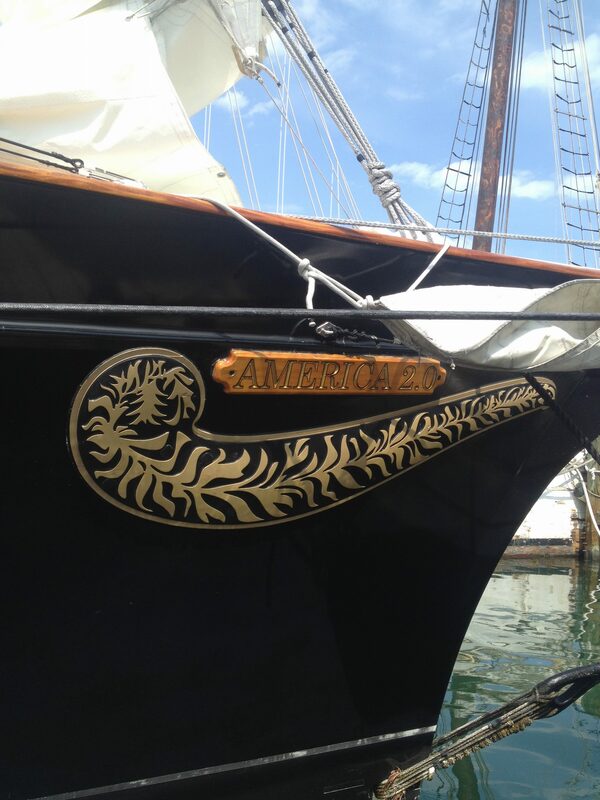 While we were in Key West the “America 2.0” was in port making daily sunset cruises and short local charters. She’s a model of the original Schooner America that won the first America’s Cup in 1851. She’s 105′ overall with 3600’sq of sail. She also has freestanding carbon fiber masts. 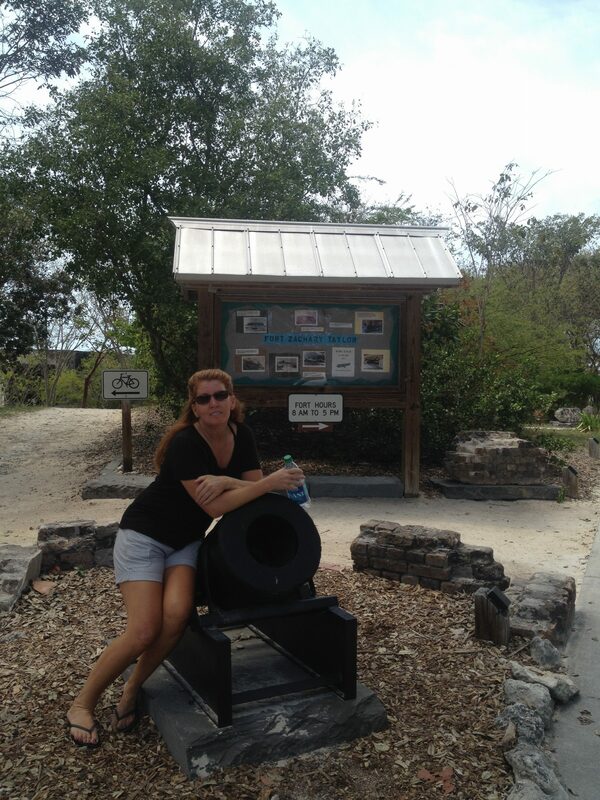 Kim with “shot cannon” at the entrance to Fort Zachary Taylor. A cannon restored and mounted inside the fort. 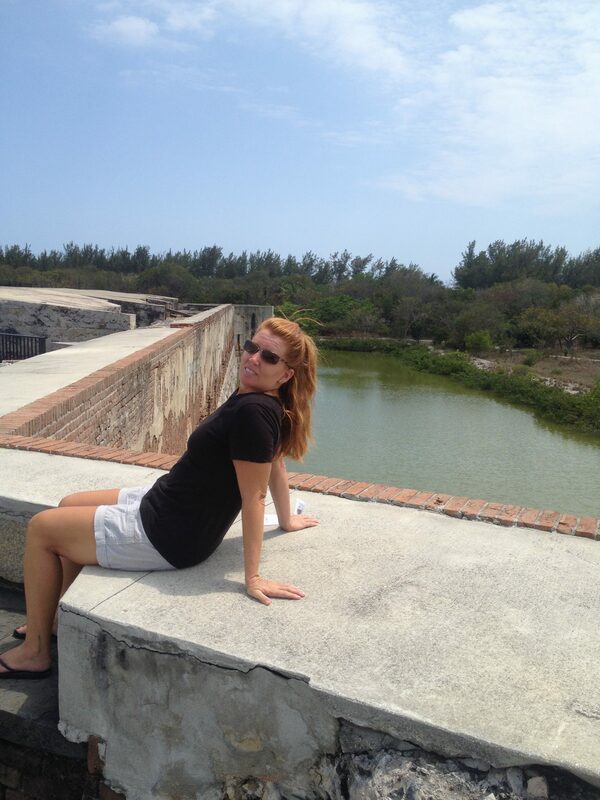 There’s a pretty cool story about the restoration of the fort in Key West. Construction for the fort was begun in 1845. It was originally constructed by the army and used heavily in 1898 in the Spanish American War. 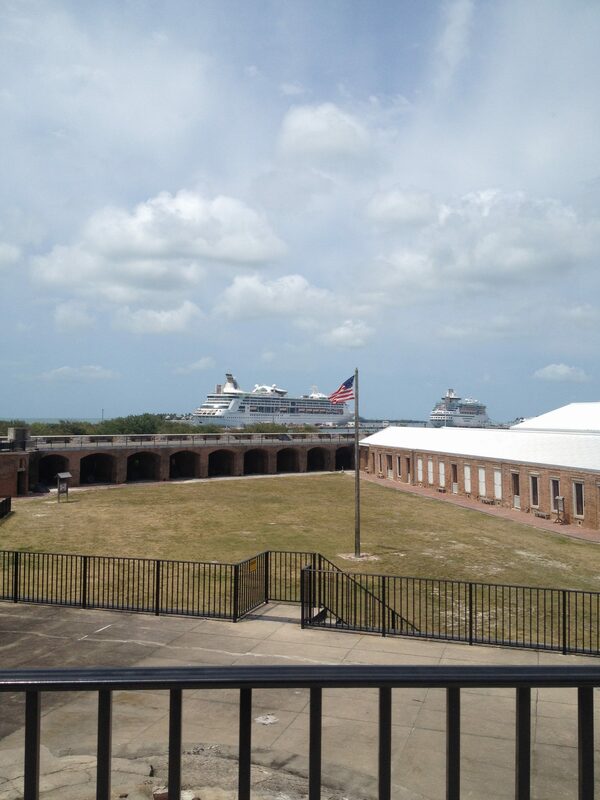 In 1947 the fort was turned over to the U.S. Navy and was used for storage. It was basically a dumping ground and most of the historical parts of the fort were buried. 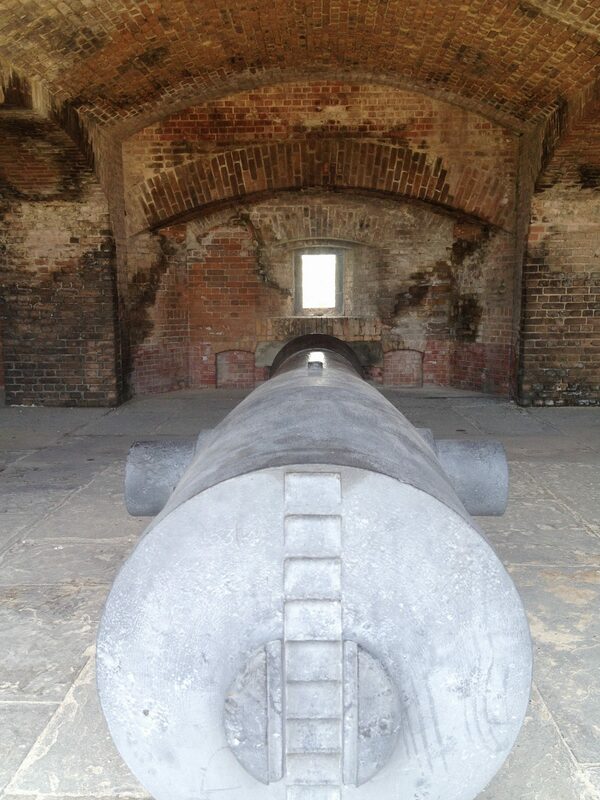 In 1968 a local named Howard England recruited volunteers to excavate the fort walls and restore the cannons. 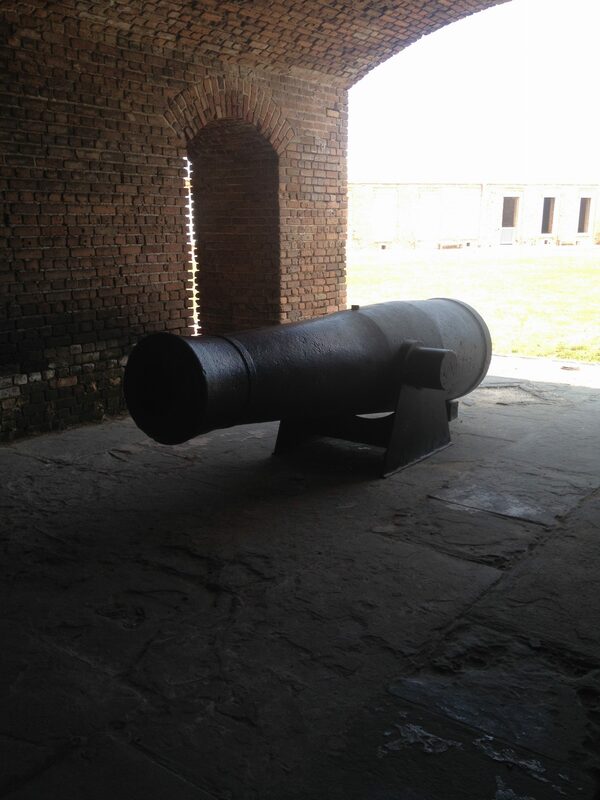 It was discovered that the fort contained the largest number of Civil War Cannons anywhere. England invested ten years restoring the fort. Thanks to his efforts and his volunteers nicknamed “sandhogs” the fort went from abandoned dumping ground to tourist attraction with a beach covering 87 acres. 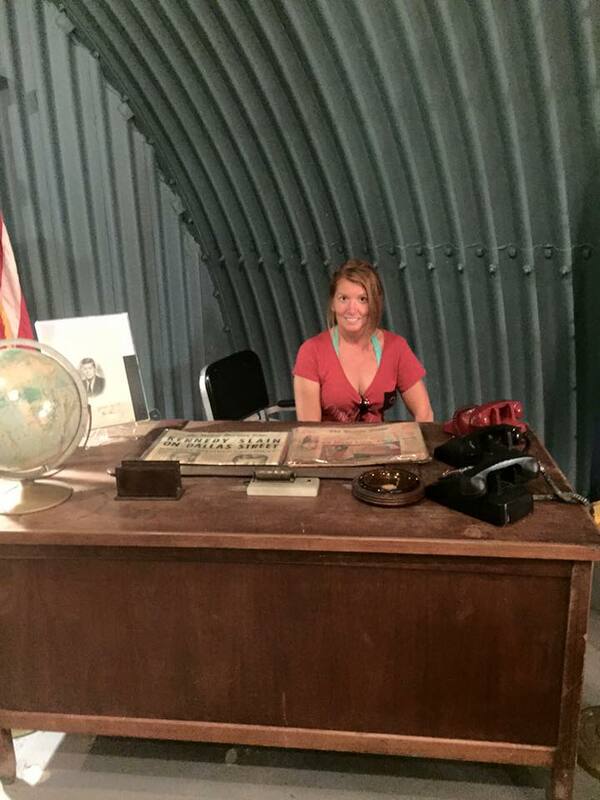 Next time ….Key West Part Deux…..or part drunk? Well, we have made it to the Keys 🎉🎉🎉🎉🎉 !!!!!! We spent a few days motoring south on the ICW in order to reach Lake Worth where we planned to leave Florida and re-enter at Biscayne Bay just South of Miami. We enjoyed a visit from my youngest sister and even convinced her to pilot the boat for a short period …….sadly, it was the first time we can recall not seeing any Dolphins or Manatees…..it was weird. My sister was understandably disappointed, but that just means she has to come back sooner. Hurry back Sis!!! We we spent an unexpected three days in Ft. Pierce due to the New Year holiday (who knew some marinas closed all day on New Years Day?) and discovering that the wind was going to be pretty heavy plus we had developed a stalling issue with our diesel. We discovered the issue while trying to pick up a mooring ball in Vero Beach…..it is a VERY SMALL area with two and three boats on some mooring balls…….a pretty exciting few minutes there…..my apologies to the residents of that mooring field….we couldn’t slow down and when I did, we stalled so I had to come in at about 4 knots and then once we went to neutral we stalled and coasted up to the ball. We did get to meet a VERY nice and professional TowBoatUS Captain named Al, the next day in Ft. Pierce, which was our first ever tow….if you don’t have BOATUS Towing insurance I highly recommend buying the best package you can afford….we use the unlimited Gold and its only $180 per year and worth every cent….this tow alone would have been $370. A great by product of this mechanical misadventure was that we discovered what we have decided must be manufactured from voluntarily donated unicorn blood, or some other mystical creature. Our diesel started fine….ran fine for hours…..then when we tried to shift for neutral we would stall……after some research and consulting with the folks at Trans Atlantic Diesel (a big Thank you to our diesel guru Marcus Neville) we acquired the magic juice…..
It’s called “Stanadyne Performance Formula” and your diesel can actually run on just it, but it’s about $80 a gallon, so if you have that kinda coin, can you float me a little?? Long story short, we drained our fuel filters and filled them with this additive, ran the engine at varying RPM’s for an hour ….and …..VOILÁ !!!! SHE RAN LIKE NEW !!!!! We couldn’t even cause a stall…..
We left Ft. Pierce on January 2, 2016 after ringing in the New Year at Cobb’s ….a great restaurant and tiki bar in Ft. Pierce. If you ever get near there I highly recommend that stop. We made a quick one night stop in Stuart where the winds howled again that night. We had the chance to catch up with some friends from our old sailing club, Rick and Cathy. We arrived arrived in Lake Worth the next day and spent five days in a Marina since the winds kicked up yet again and were blowing 30 knots. Once that settled down we proceeded on our trek where we anchored just South of Peanut Island (where the JFK Cuban Missile Crisis bomb shelter was built) and we spent five days there again riding out 20+ knot winds…. And rain….and heavy chop…..did I mention that I think the wind is following us ? Lake Worth stretches between North Palm Beach, West Palm Beach and Palm Beach…..
Peanut Island is a man made island constructed from then dredged material created from the digging of the Palm Beach Inlet and Basin and is also the home to JFK’s Cuban Missile Crisis Nuke Shelter. It seems his family owned a home nearby and the Secret Service chose this spot in the event of a nuclear attack to protect the President. 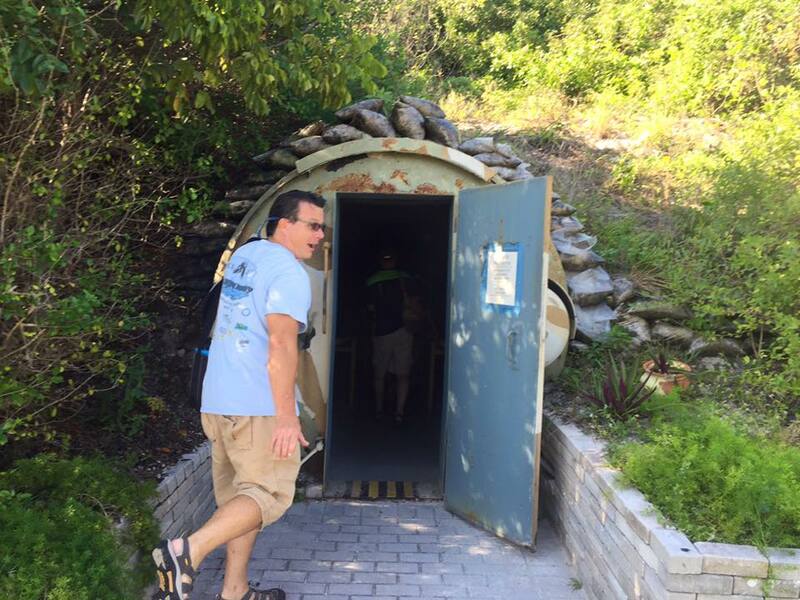 Me …running for the bomb shelter!!! ….had worn through the starboard side thimble …. (a thimble is curved section of metal fitted into a loop of spliced line to protect the line from strain and chafe)….so we had to get that replaced at Florida Line and Rigging….another great cruiser friendly place in Palm Beach and Erin really hooked us up, had the new line done in an hour and did a great job on our new snubber line. See the really rusty loop at the end of that line ?? Rust bad…. 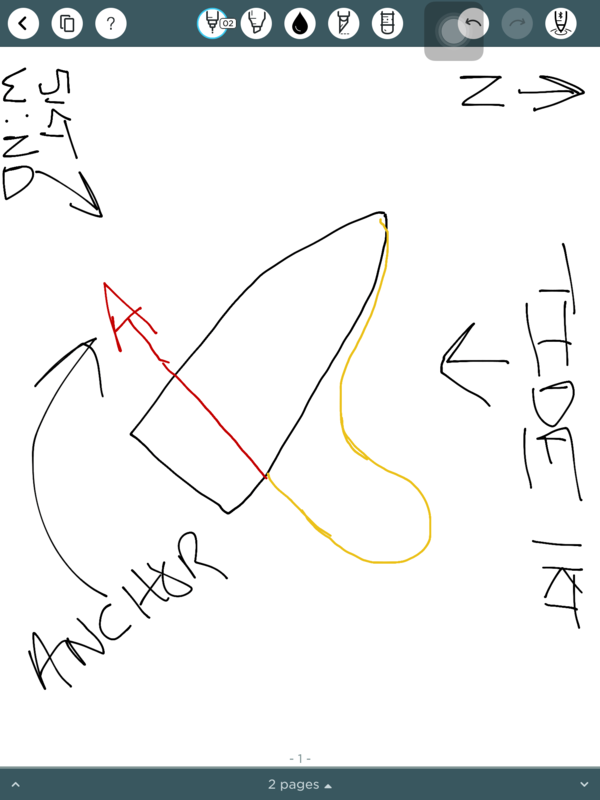 The winds and tides at Lake Worth so often ran against each other that our boat and anchor line looked like they were practicing yoga or twister…..I made a rough diagram of how it looked on one day……the yellow line is our anchor chain…the red part is the chain and anchor that was buried in the sand……its no wonder people often think their anchors are set when their boat doesn’t drift away but many times it’s just the tide and wind working against each other plus the weight of the chain and anchor holding you in place….that’s why we always back down (i.e. Reverse and pull) against our anchor to be sure we are set. 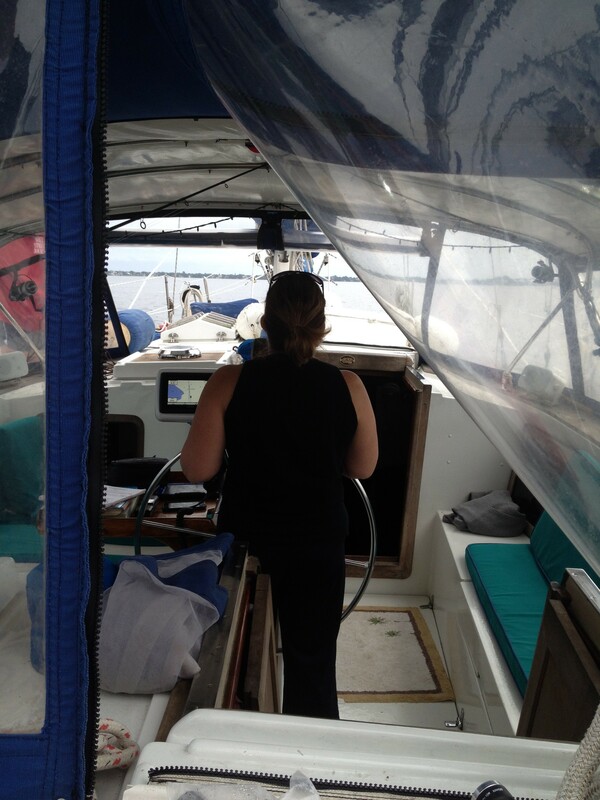 We left Lake Worth and cruised down the coast with 15 to 20 knot winds behind us and following seas…..sadly, not as comfortable a ride as the old saying would lead you to believe. After we came into Biscayne Bay and crossed over into Key Largo, we stopped over at Gilbert’s resort for a night and met a nice couple who worked there, they are also interested in living on their own sailboat….it was great to meet you Lorenzo and Kate…..